Thanks to Nimbus Publishing who sponsored this post so that we can help cultivate little readers who love local books! As always, all opinions are our own. Most Haligonians know the story of how the people of Boston came to our aid after the catastrophic disaster of the Halifax Explosion; and, in turn, we send them a Christmas tree each year as a thank you. To help children learn about this story and tradition, Marijke Simons has written and illustrated a book called The Flying Squirrel Stowaways: From Nova Scotia to Boston (affiliate link). This book is our featured book for the Itsy Bitsy Nimbus Book Club this month. In the story two flying squirrels are playing around and end up in the tree that's destined for Boston on the day it's being cut. Thus starts a journey where they travel through the Halifax celebrations, across the ferry to Saint John and the border to the US, and finally to Boston where they explore the city before finding a new home to watch the tree lighting. After reading a book, children have a natural desire to learn more about what they've read. We've put together some reading extension activities for the Itsy Bitsy Nimbus Book Club to help them understand this book on a deeper level, much the same way we, as adults, enjoy going to a book club to discuss our favourite books. 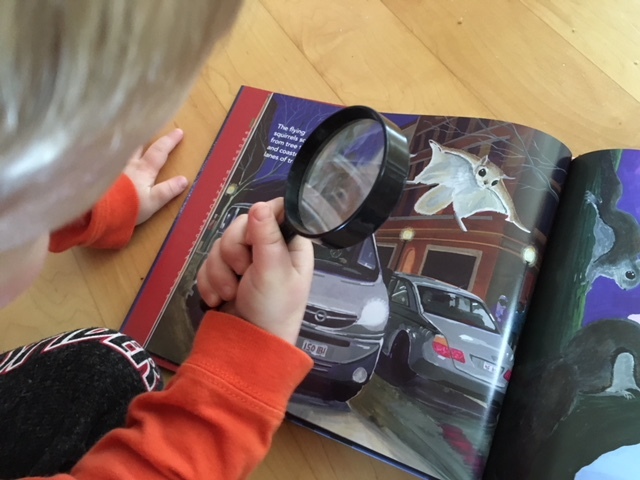 We love a good excuse to connect reading, art, and local geography and this book is perfect for this type of activity. Grab a long piece of white butcher paper or poster board and photocopy or draw images of a plain evergreen tree, a decorated Christmas tree, a transport truck, and two little flying squirrels. Sketch out a map with Nova Scotia, New Brunswick, and Boston, or have your child draw it themselves. Miss M is six years old and she was super excited about making her own map of the tree and the squirrels' journey. It also gave us a chance to talk about our own journeys through many of these spots. There's one you can use as a guide near the back of the book. Have the children follow along with the story as you read with the characters. Put the squirrels in the tree, the tree on the truck, and then drive the whole lot along the map towards Boston. Mr. M loved having the job of gluing the images to the right spot on the map. When my children finished the map, they flipped the paper over and asked me to draw a Christmas tree that they could decorate themselves, using the image in the book as their inspiration! Finish the activity by reiterating the explanation in the book about why Nova Scotia gives this tree to Boston every year and how it's important to help others in their time of need; and to thank those that help us. Once the squirrels arrive in Boston they go on a little flying tour of the city and see several famous sites. A second map could be made of the city with these sites labelled and the squirrels could fly around and explore as they do in the book. Most local children will have seen squirrels before, however very few are likely to have seen flying squirrels as they are nocturnal creatures. Children are naturally curious and learning that an animal that they see regularly scampering through the local park has a flying cousin, well, that's just great fodder for their active imaginations! Engage them in a research project to learn more about these local critters. We called ours an "investigation" and to my budding detective children, this got them primed to solve all the mysteries of the flying squirrel. Start by creating a list of questions they would like answered. Use the internet and nonfiction books to track down the answers. Maybe even pull out a magnifying glass and examine the pictures in the books to gather more clues about these critters! What parts of Nova Scotia do they live in? When and where do they sleep?! You could also take a field trip to the Museum of Natural History and/or Hope for Wildlife, who will likely have people who can help find the answers to the questions being asked. 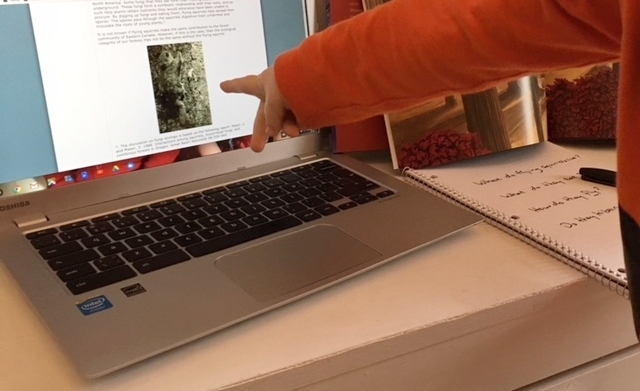 Add a second research project to help the children learn more about the Halifax Explosion, which happened one hundred years ago this December. Find out what their questions are and get some child-friendly books on the topic, or even take a trip to the Maritime Museum of the Atlantic which has more information, including models of the ships, on display. Follow along with this year's tree's journey to Boston, and then watch the tree lighting live. Keep an eye open for those flying squirrels! *Edited to add: click here for the 2018 schedule of events! Thanks for joining us! If you haven't read our other book club posts yet, be sure to check out more book extension posts by clicking here. You can buy this book directly from Nimbus , or from one of their many booksellers such as Woozles, Bookmark, Chapters, and Amazon (affiliate link). We’ve teamed up with Nimbus Publishing to give away a copy of The Flying Squirrel Stowaways: From Nova Scotia to Boston. Fill out the Rafflecopter form below (and, ***IMPORTANT***, make sure you come back to the Rafflecopter widget and check off each task you complete in order for it to be counted as an entry). *Winners must be age of majority in their home province/state and be residents of North America; excluding Quebec.